So, I hate the word “office”. 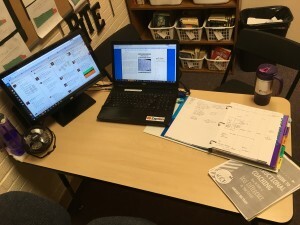 Most teachers don’t have offices, so when I made the switch to instructional coaching, I didn’t like the sound of the word “office.” So I call this my “room”. 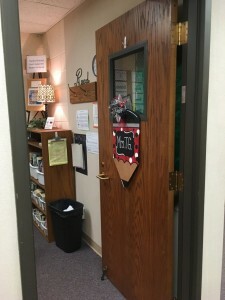 Being very visual, I LOVE peeking into the “rooms” of other instructional coaches and looking for ideas. This was especially true last fall when I first started as a coach. 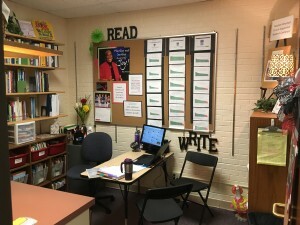 So, knowing that there are a ton of new instructional coaches and teacher leaders in our area, I thought you might want a peek into MY “room”. I keep a pencil can and sticky notes on the counter right as you walk in. That has come in handy so many times! 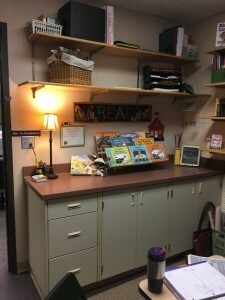 I also rotate the books I display on the wire rack every month. Right now I have back-to-school books featured on it. 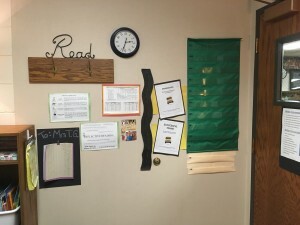 The green pocket chart is behind my door so kids can’t see it when they come in. 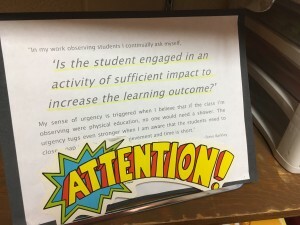 I make an index card for each kiddo that has some reading concerns and update it with assessment data throughout the year. 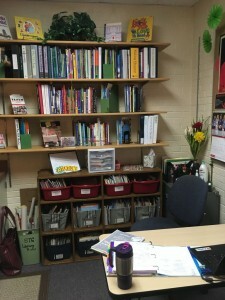 By adding two rows made out of manilla folders on the bottom, I have a row for each of our K-5 teachers. Periodically, I take the row of cards out and go and visit with that teacher to see how the kiddos are progressing and help brainstorm as needed. One of the joys of being an elementary school teacher is getting those precious notes from the littles. I’m so fortunate that a few of them send ME notes throughout the year. I decided to add a black “frame” to make those works of art stand out. I also have a couple of reading posters and my family Christmas card on this wall. I have tried all kinds of ways to check out books over the years, but I keep coming back to this. A simple legal pad on a clipboard attached to my bookshelf by a 3M command hook is just the EASIEST way for ME to keep track. 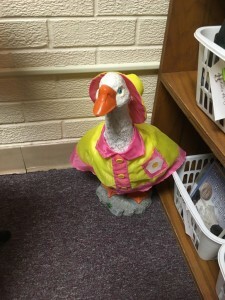 Lucy Goose is cheesy, but she was my mom’s and makes me happy. Plus the kiddos like to see her outfits change through the seasons. 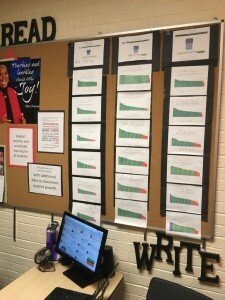 I hung up last year’s grade level fluency data (fall, winter, spring). This is the starting point for our discussions on who could use some interventions. I plan on putting THIS year’s data over the top of these as we go this year. It’s a great visual way to see how we are doing. I like the idea of this kind of data being like a FLASHLIGHT, not a hammer. It helps us SEE where we are at, where we have been, and where we are going. I can clear the table off easily and have room for a kiddo or two to sit with me, so I like the table instead of a desk. Note my planner from Ms. Houser and the ebook that I printed from Chrissy at “Buzzing with Mrs. B.” Also, I went ahead and bought myself an extra monitor. I just found that I often have 15 different things open at one time, and this allows me to keep a couple things viewable at the same time. 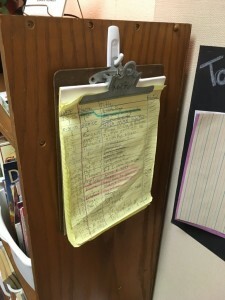 Posted on August 3, 2016 by mrstg • This entry was posted in Teaching. Bookmark the permalink. How exciting to begin your first year as an instructional coach! I just had a colleague ask some of the same questions you are asking. I typed up a three page response for him–I just kept thinking of things he should know. I copied and pasted what I sent him into a blog post. You’ll find it on my blog today. (http://mrstg.edublogs.org/2016/08/21/instructional-coaching-what-do-you-do-advice-for-first-year-coaches/). Read through that and let me know if you have any other questions. Love your Blog! 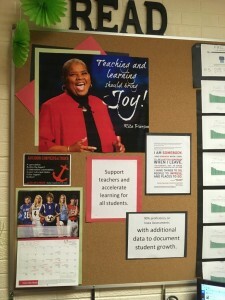 This is my first year as an instructional coach. What tips can you give me? Also, how do you run a PLC effectively? 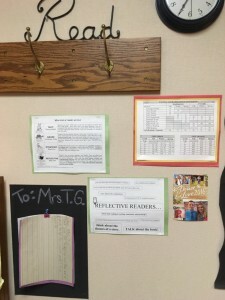 How do you manage each grade level? Thank you! Any help you can give me would be greatly appreciated! Just discovered your blog and LOVE It. 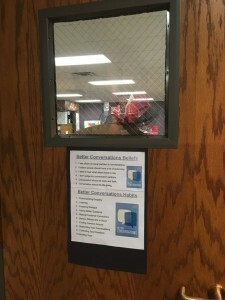 Would you consider sharing the Better Conversations beliefs and habits poster you typed up for the back of your door?